Exercise is important for children’s health. Whatever their level of ability or disability, all children should get around an hour of exercise a day. Children with learning disabilities or difficulties should be able to join in with most or all sports activities, provided their individual needs are taken into account. For children with learning disabilities, exercise can improve confidence and social skills, and allow the children to burn off excess energy, which can help with concentration and sleep. Some children with learning disabilities have problem with co-ordination and motor control, and sport and exercise can improve this. Team sports can teach children about teamwork and sharing, and can help to integrate children with learning disabilities into their peer group. Sports and exercise can also help children with learning disabilities deal with frustration and stress. Groups where children with learning disabilities can join in can also give parents or carers a time of respite, as well as an opportunity to meet people in similar situations and provide mutual support. There is a huge range of learning difficulties and disabilities, and the issues will vary widely according to the individual disability and the individual child. For example, children with autism spectrum disorders may find it difficult to work as part of a team, and children with attention deficit hyperactivity disorder (ADHD) may struggle to concentrate. Some children will have problems with speech or understanding, and some may not be able to read instructions or recognise numbers. A number of children with learning disabilities may have behavioural disorders as well, which can make it difficult for them to understand about sharing or taking turns, and may cause problems with other children over issues about winning and losing. Some children with learning disabilities may also have physical disabilities, or problems with motor control or co-ordination, and these need to be considered when including them in activities (see ‘Exercise for Kids with Physical Disabilities’). Some learning disabilities are associated with other health issues, such as heart disease in Down’s syndrome, and being fitter can help offset these additional risks. Children with learning disabilities should be able to take part in any sports that other children enjoy, though the rules may need to be adapted according to the learning disabilities or difficulties. 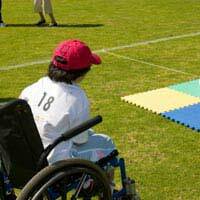 It is a good idea to keep sports and exercise simple and straightforward for children with learning disabilities. The instructions should be in clear and plain language, and may have to be repeated a number of times. Some children may need written instructions; others may find instructions as cartoons, pictures or photographs more helpful. Having exercises that include lots of repetitions can make them easier to learn. Doing sports and exercise with children with learning disabilities can be very frustrating, but can also be very enjoyable and rewarding. Some local councils, charities and community organisations have created sports groups and coaching especially for children with learning disabilities, or groups that integrate children with learning disabilities in with children without these issues.